No, that’s not going to be the name for the satellite of Orcus. But it was suggested a surprising number of times, and it did make me laugh every time I read it. When I decided, on a whim, to throw open the naming of the moon of Orcus, I thought I’d get a few suggestions here and there and make a quick decision. More than 1000 suggestions later I’m a bit overwhelmed and thoroughly torn. There were good names, silly names, scholarly names, names of people’s pets and wives and girlfriends (never husbands or boyfriends, though, which is interesting). Names came from came – not surprisingly – from Etruscan mythology, but also Norse, Aztec, Greek, Hindu, and many more. There were references to current media in all forms, there was word play, and there were made up names that simply sounded good (or at least someone thought they sounded good). After sorting through all of the suggestions, as few interesting names/themes stand out. Disney-related. With Orcus being described as the anti-Pluto there was some sentiment to pull in Disney mythology instead of Etruscan mythology. I’m not opposed to the general idea of moving beyond ancient mythology, so I thought about these. But the problem with all of these names, I felt, was that there was no connection to Orcus, only to Pluto. Dungeons and Dragons related. Unbeknownst to me, Orcus has been a major figure in the role-playing game Dungeons & Dragons for the past 30 years. To be fair, though, the phrase “unbeknownst to me” is not exactly true. It really should be “unremembered by me.” My father bought one of the original Dungeons & Dragons sets for my brother and I back in 1976 as a way of keeping his nerdy science fiction loving boys occupied during weekend visits. I will admit to having been an avid player throughout high school. It was a great outlet for a nerdy science fiction loving boy. And though I haven’t thought about it in nearly 30 years, I got sudden senses of nostalgia from all of the D&D related suggestions. I thought of those first few times sitting with my brother and my father (my sister thought we were all crazy) in his apartment trying to figure this stuff out. But, but, but… Could I really give a name that will stick around for years (hundreds of years? thousands of years? I have no idea) based on a fantasy game that has only been around for thirty years? Would astronomers in 200 years look back on a name like that and think it was a quaint anachronism or just kind of dorky? Maybe. The connections to Orcus are good, even if the mythology is recent. Tokien related. Many people noted that the word “Orc”, the foot-soldier bad guys from Lord of the Rings, is said to be derived from Orcus (possibly by way of Beowulf) and suggested related names. I should have the same flash backs to nerdy-science-fiction childhood for these suggestions, but I don’t, and I suddenly realized why. Those flashbacks memories seem to keep being overrun by replaced mental images of Elijah Wood and friends running around New Zealand. There is the same concern about ephemeral popular culture, though these days Orcs are pretty mainstream. But, still, the connection is to the potential origin of the word Orc, as opposed to being to Orcus himself. Somehow, again, that seems not quite right to me. Silly related. Perhaps the biggest laugh I had when reading these came from someone suggesting “Mindy.” Mindy, of course, was the counterpart to Robin Williams’ Mork. Who was from Ork. The other surprisingly common silly suggestion was “Fiona.” As in, Fiona, bride of Shreck. Shreck, of course, is an Ogre. And then there was – frequently! – “otulP” as in Pluto, backwards. Surprisingly, the more appropriate “norahC’ as in Charon, backwards, rarely showed up. Un related. People, don’t even start with me. Colbert? Seriously? When people were talking about my discovery of Eris did Stephen Colbert have me on his show? No, he did not. He instead had Neil Tyson. When Pluto was demoted from planet to dwarf planet did Stephen Colbert have me on his show? No, he did not. He instead had Neil Tyson. 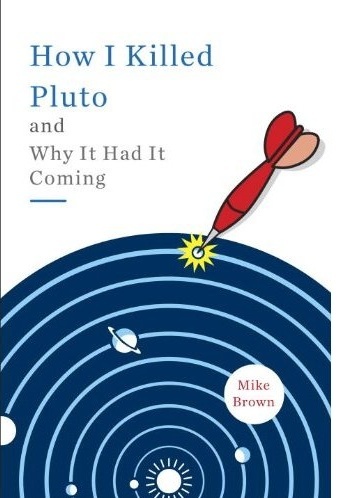 When Neil Tyson wrote a book about the demotion of Pluto did Stephen Colbert have me on his show? No, he did not. He instead had, well he had Neil Tyson. People, I have this to say: Stephen Colbert is dead to me. And I don’t mean “dead” in a “now-that-he’s-dead-and-in-Hades-hanging-out-with-Orcus-I-can-name-the-satellite-after-him” sort of way, either. Whale related. Orcus sounds an awful lot like Orcas, as in the “killer whales.” The name Shamu was a shoe-in here, but I liked better the names of the real-life Shamu’s real-life children. Someone even suggested that the name be related to Orcas Island, the largest of the San Juan Island off of the coast of Seattle. It is a well kept secret that part of the appeal of the original name “Orcus” for this Kuiper belt object was that it sounds like the island. My wife Diane lived on Orcus Island through her high school years. We go back to visit as often as we can. The name was a small present to her. She has, of course, thoroughly forgotten about this by now. But I could indeed revive her memory by naming the satellite after something related. One summer while we were visiting and playing our typical game of “let’s pick up a real estate guide and fantasize about houses we can’t afford” I became enamored of this one house that was on a tiny island just off of Orcas Island. You have to go back and forth to Orcas by motorboat to get your groceries, visit your favorite coffee shop, or walk more than 200 yards at a time. I talked about it all the time and how much I would love to have a house on an island like that. Diane became worried that I might actually be serious. I have, in the past, lived in odd places like sailboats and cabins in the woods with no running water. I might have it in me. I think that just to keep Diane a little on her toes, it would be fun to remind her of this time and name the satellite “Crane Island.” But, really, Orcus is not Orcas. And not even Shamu. So I sadly have to pass on this one. Finally, we get to the more ancient mythology. As I admitted earlier, my heart was always here, though I was willing to consider these other themes. Overall, the suggestions of and votes for Greek, Roman, and Etruscan mythological characters exceeded all of the other suggestions by a large amount. At this point, I believe it best to revert to the analysis offered by readers here. My suggested name is Prosperina. Sources differ, but as far as I can tell, Orcus and Dis Pater (the origin of ‘Dis’, which of course we see as the capital of hell in the Divine Comedy) were synonyms for the same godProsperina was the Roman name for his wife, and you will know her as Persephone, doomed to live for 4 months in hell and for 8 months in heaven because of her consumption of a single pomegranate seed. I like this because I imagine this little moon captured and dragged out on Orcus’ great elliptical orbit, destined to wander far from the plane of the planets for all eternity, a little icy queen of the void. Gosh, I need to go and have a cup of tea to cheer me up now. Pluto was god of the underworld in Roman mythology, and Charon ferried souls across the river Acheron in early Greek and Roman mythology. Pluto has his equivalent in Orcus, being used as an alternative name for Pluto, and having separate connections to the underworld. Charon, too, has an equivalent in Phlegyas, ferrying souls across the river Styx. Since the Kuiper belt object Orcus can be considered the anti-Pluto and therefore is named due to this relation, it seems fitting to name the first moon of Orcus in a way that fits the connection between Pluto and its first moon, Charon. This, of course, would lead to the name Phlegyas being chosen for “S/1 90482 (2005)”. In addition, Charon, in mythology, seems to be completely connected with the underworld with no indication that he ever existed apart from it. On the other hand Phlegyas does not enter the underworld until Apollo kills him for burning his temple. If Pluto and Charon formed out of a giant collision, as is believed, then Charon's entire lifetime is linked to Pluto. However, if Orcus captured its moon,which may be the case, then it would have existed before its connection with Orcus. This is even further correlation between the connections in mythology of Pluto to Charon and Orcus to Phlegyas and the objects in our solar system. So, to be true to the connection between named objects in the solar system and mythology, as well as to the connection between Pluto and Charon and Orcus and its first moon, I propose the name "Phlegyas" be given to the object “S/1 90482 (2005)”. And so finally I have to chose, after all of these good names and great discussions. And so. And so. And so…..
Prosperina has a great connection to Orcus, but she is more strongly associated with Pluto than with Orcus. I like the idea of keeping Orcus and Pluto distinct. Cerberus suffers from the same problem. I am strongly drawn to Matthew’s description of Phlegyas, in particular the strong link to the mystery of the formation of Orcus’s moon. That’s good. Really good. I was almost about to say OK, let’s do it, but I got stuck. Phlegyas is being punished for burning down Apollo’s temple after Apollo killed his daughter. He now wanders Hades reminding people to respect the gods. Are kidding me? If Apollo ever came down and killed my daughter he would get much worse than just his temple being burnt down. And when I went to Hades I would not talk about respecting the gods. Every time I read his story I just get mad. Maybe putting Phlegyas in space releases him from his punishment in Hades. And finally Vanth. I will tell you this: Vanth got the most votes. It was never my intention that this become an election, but, if it had been, Vanth would be the winner. The appeal to me – and to everyone who voted for Vanth I would guess – is pretty clear. Vanth is one of the few purely Etruscan deities, and a chthonic one at that. She is a psychopomp. I mention these last two facts mainly because I had no idea what they meant until I looked them up (she is an underworld god who conveys dead souls, is what it means). She likes to hang out with Charun, a name which derives, unsurprisingly, from Charon, which makes a nice parallel. And while she’s associated with the underworld, she is a guide rather than an avenger. She awaits the dead and brings them to their new home. Vanth doesn’t do nearly a good a job of telling the potential story of the formation of the satellite of Orcus, though. So until yesterday I was still unsure. But yesterday while reading about Vanth and reading about Phlegyas, I stumbled across a picture of very nice fresco at the tomb of Anina. Vanth is waiting for the dead, as she is often depicted. It even appears to me that she is silently crying while she waits. Admittedly, I might be misinterpreting, but still, the tear made me think of my sister, waiting for my father – guiding my father – as he took his last breaths. In a solar system filled with Apollos (asteroid #1862, discovered in 1932) who might kill your daughter, Zeuses (asteroid #5731, discovered in 1988) who might abduct your daughter (or your son, for that matter), Tantaluses (asteroid #2102, discovered in 1975) who might feed you his son, or Erises (the largerst dwarf planet, discovered in 2005) who might start a world war, wouldn’t it be nice to have someone who weeps for the dead? Wouldn’t it be nice to have a guide to light the way? So it will be Vanth. Discovered 13 Nov 2005 by M.E. Brown and T.-A Suer. Vanth is a daimon in Etruscan mythology who guides the dead to the underworld. She often appears on tomb paintings and sarcophagi where she is depicted with wings and a torch, and she is frequently shown in the presence of Charun, a guard of the underworld. Name suggested by Sonya Taaffe. Thanks to everyone for participating. Having gone through all of this, I realize that naming a moon was perhaps a bit too constraining, as the theme was already in place. Next time perhaps we will try to find a name for one of the many many other objects out there that are deserving and for which the field is wide open. As always, stay tuned. Good choice. I really like Vanth: not just she's also Etruscan but the name sounds terribly cool (unlike Phlegyas, that sounds like phlegm - not to mention that I fully agree with your criticism of the legend and that he's not Etruscan anyhow). Btw, the most common spelling is Proserpina or (anglicised) Proserpine, from proserpere (to emerge). Apparently Prosperina/e also exists but must be a mispelling that somehow stuck in English - I have never heard/read anything of the like in any Romance language. I am still grinning randomly about this, I hope you understand. Thank you. Let's hear it for the Etruscans! Nice. I'm saddened you didn't use my suggestion of Thanatos, but I do like Vanth. Perhaps you can use Thanatos for the next plutino sattelite you find? And I find it interesting how I'm usually one of the first to comment on your posts. Great choice. Is "major moons of plutinos are psychopomps" now a convention? Why did you give up playing D&D? You have no idea what you're missing! I felt sure that there would be somebody into early myths, an expert, to whom the answer would be obvious. Maybe I should find a Cherokee name. Unfortunately, I don't know the alphabet. These contests are fun, even if you can't make a particularly relevant offer. Everybody has some piece of personal history somewhere. Most Cherokees these days study the Judaeo-Christian mythology and my suggestion in that pantheon didn't work. I like this convention of consulting the general public. Maybe something paricularly apt is out there. So, ah... I'm guessing you don't like Colbert much, eh? I love it! And look how much fun mythology we all got to learn along the way. Glad it was your task to parse all the good suggestions. We may not have the audience of the Colbert Report, but you have a definite invitation to speak at the Sudekum Planetarium when we open our full-dome version of "Nine Planets....and Counting"
Please help a beginner ? Is your 90482 Orcus the same body as MP019808? or 2004 HB 79? orcus the dwarf planet.I love it.